Suspension lugs are used in a variety of industrial applications, especially in defense, where a heavy object needs to be suspended. For example, they are used for attaching rockets, pods, etc. to aircraft. 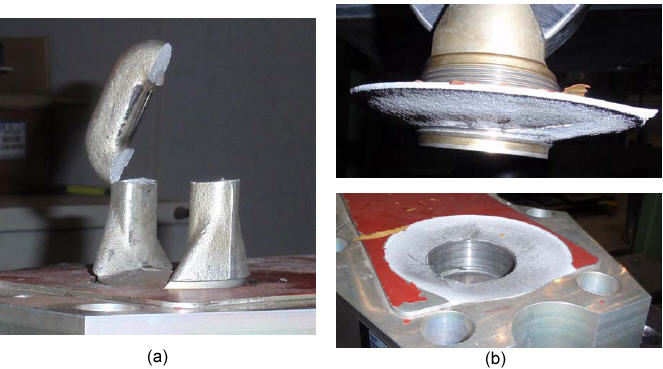 In this Brief we present a study that investigates the failure mechanism of a suspension lug using experimental and numerical methods. Figure 1 shows the experimental set up of a suspension lug. A high strength stainless steel suspension lug was screwed into a threaded blind hole of a high strength aluminum adapter structure and was pulled vertically. The main focus of the experiment was to understand the failure behavior and the limits of the lug and the adapter due to cyclic loading at specified load levels . The test was carried out at the Construction Engineering Laboratory at the Universität der Bundeswehr, directed by Prof. Dr.-Ing. Ingbert Mangerig . In the experiments two different failure modes were observed. In one of the failure modes the lug itself fails (see Figure 2a). In the other, the adapter fails (see Figure 2b). To get a better understanding of the failure mechanisms, various nonlinear finite element analyses were carried out using ADINA. First, to study the load transfer mechanism, a 3D finite element model of the lug and the adapter was considered. Due to the symmetry of the problem only a quarter of the lug and the adapter was modeled and appropriate boundary conditions were applied at the planes of symmetry. 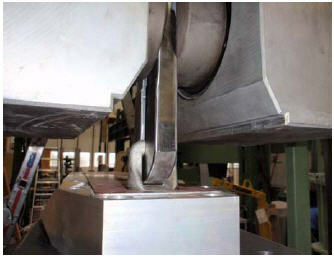 The lug was subjected to a tensile force (see Figure 3a). Contact conditions were introduced between the lug threads and the adapter threads. Some of the results are depicted in Figure 3. It can be seen that the softer adapter material undergoes larger deformations. Also, significant stress concentration can be observed in the lowest two threads as well as in the notch root radii of the lug hook. 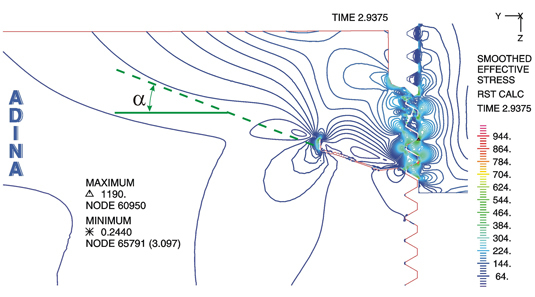 Next, to investigate the failure mechanism of the lug-adapter system, a 2D axisymmetric model was considered. Both elastic and multilinear elasto-plastic material models were considered. Also, different assumptions regarding the number of interacting threads were examined. In the first analysis, the interaction between only the bottom 3 threads was considered and the material was assumed to be linear elastic. The analysis configuration, contact forces and stresses for this case are presented in Figure 4. Isolines of the shear stress σyz, the hoop stress σxx and the effective stress are presented in Figure 5. Assuming that the crack initiates in the lowest thread notch, we can see that the line emanating from the lowest thread notch at an angle of 20° matches one of the isolines and compares very well with the measured rupture angle of . In the previous analysis, the material model of the lug and the thread adapter was assumed to be linear elastic and the interaction between only the bottom 3 threads was considered. To predict the behavior of the structure with better accuracy, another analysis was carried out in which the multilinear elasto-plastic material model was introduced. Also, the "death upon rupture" feature, available in ADINA, was used and the interaction between the bottom 4 threads was taken into account. The results are presented in Figure 6. As seen, the rupture line follows very closely the experimental measurements. The movies at the top of the page show the evolution of isolines of the effective stress and the shear stress as the load increases and also the path along which the rupture occurs.